MS Amlin AG Bermuda Branch, a global re/insurer with offices in Bermuda, will be the title sponsors of the ITU World Triathlon Series in Bermuda on April 28th, with the event to be branded as the ‘MS Amlin World Triathlon Bermuda’. The prestigious ITU event in Bermuda is the second of eight stops on the World Triathlon Series circuit before the finals in September, 2018. “With ITU events taking place across the globe and in many countries where MS Amlin has offices and clients, sponsorship of this event appears to be the natural next step for MS Amlin,” the company said. Rob Wyatt, CEO of MS Amlin AG Bermuda Branch, commented: “We are honoured to have been chosen as the Title Sponsor for the first ITU World Triathlon being held here in Bermuda. “As an active office keen on sport, we are delighted to be lending our support to such a fantastic event – particularly one that resonates with Bermudians thanks to the success of triathletes such as Flora Duffy. Pat Phillip-Fairn of the Bermuda Tourism Authority also commented: “We look forward to welcoming the world’s top athletes and triathlon enthusiasts to experience all that Bermudahas to offer. residents are being encouraged to be out in full force, to proudly support Bermuda’s achievement as host and to support reigning eight-time World Champion and Olympian, Bermudian Flora Duffy. The day will comprise of both the Elite race and the Age Group amateur race, which will attract hundreds of runners. 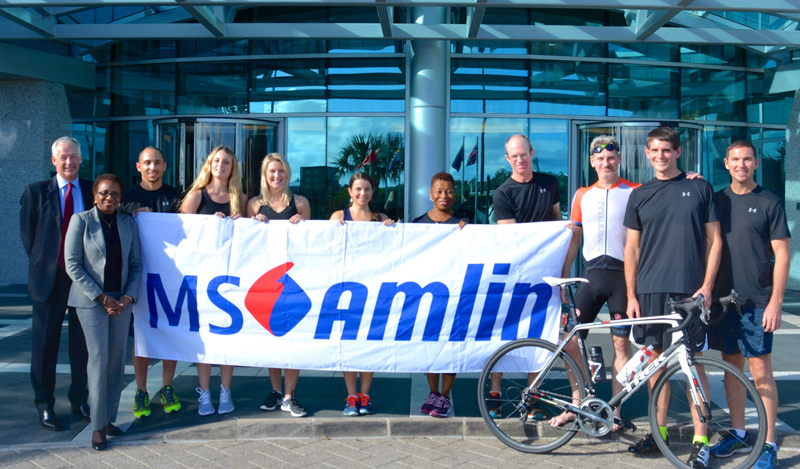 A team of employees from MS Amlin will participate in the amateur Age Group triathlon race, while others in the MS Amlin family will volunteer at the event. Front Street, Hamilton will be the focus of all racing and MS Amlin’s Bermuda offices which will also house the event office, is well positioned on the course. Organisers welcome sports enthusiasts of other disciplines to register and train for the April event, which does not require a qualifying time. Fantastic news! MS Amlin is a very cool and progressive employer, and it’s exciting to see them supporting Bermuda on the world stage!